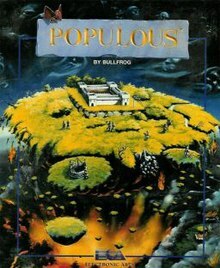 Populous is a video game developed by Bullfrog Productions and published by Electronic Arts, released originally for the Amiga in 1989, and is regarded by many as the first god game. With over four million copies sold, Populous is one of the best-selling PC games of all time. The player assumes the role of a deity, who must lead followers through direction, manipulation, and divine intervention, with the goal of eliminating the followers led by the opposite deity. Played from an isometric perspective, the game consists of more than 500 levels, with each level being a piece of land which contains the player's followers and the enemy's followers. The player is tasked with defeating the enemy followers and increasing their own followers' population using a series of divine powers before moving on to the next level. The game was designed by Peter Molyneux, and Bullfrog developed a gameplay prototype via a board game they invented using Lego. The game received critical acclaim upon release, with critics praising the game's graphics, design, sounds and replay value. It was nominated for multiple year-end accolades, including Game of the Year from several gaming publications. The game was ported to many other computer systems and was later supported with multiple expansion packs. It is the first game in the Populous series, preceding Populous II: Trials of the Olympian Gods and Populous: The Beginning. The main action window in Populous is viewed from an isometric perspective, and it is set in a "tabletop" on which are set the command icons, the world map (depicted as an open book) and a slider bar that measures the level of the player's divine power or "mana". The game consists of 500 levels, and each level represents an area of land on which live the player's followers and the enemy followers. In order to progress to the next level the player must increase the number of his followers such that they can wipe out the enemy followers. This is done by using a series of divine powers. There are a number of different landscapes the world (depicted on the page in the book) can be, such as desert, rock and lava, snow and ice, etc. and the type of landscape is not merely aesthetic: it affects the development of the player's and enemy's followers. Increasing the mana level unlocks additional divine powers that allow the player to interact further with the landscape and the population. The powers include the ability to cause earthquakes and floods, create swamps and volcanoes, and turn ordinary followers into more powerful knights. In this game the player adopts the role of a deity and assumes the responsibility of shepherding people by direction, manipulation, and divine intervention. The player has the ability to shape the landscape and grow their civilisation – and their divine power – with the overall aim of having their followers conquer an enemy force, which is led by an opposing deity. Peter Molyneux led development, inspired by Bullfrog's artist Glenn Corpes having drawn isometric blocks after playing David Braben's Virus. Initially Molyneux developed an isometric landscape, then populated it with little people that he called "peeps", but there was no game; all that happened was that the peeps wandered around the landscape until they reached a barrier such as water. He developed the raise/lower terrain gameplay mechanic simply as a way of helping the peeps to move around. Then, as a way of reducing the number of peeps on the screen, he decided that if a peep encountered a piece of blank, flat land, it would build a house, and that a larger area of land would enable a peep to build a larger house. Thus the core mechanics – god-like intervention and the desire for peeps to expand – were created. The endgame – of creating a final battle to force the two sides to enter a final conflict – developed as a result of the developmental games going on for hours and having no firm end. Bullfrog attempted to prototype the gameplay via a board game they invented using Lego, and Molyneux admits that whilst it didn't help the developers to balance the game at all, it provided a useful media angle to help publicise the game. During the test phase the testers requested a cheat code to skip the end of the game, as there was insufficient time to play through all 500 levels, and it was only at this point that Bullfrog realised that they had not included any kind of ending to the game. The team quickly repurposed an interstitial page from between levels and used it as the final screen. After demoing the game to over a dozen publishers, Bullfrog eventually gained the interest of Electronic Arts, who had a gap in their spring release schedule and was willing to take a chance on the game. Bullfrog accepted their offer, although Molyneux later described the contract as "pretty atrocious:" 10% royalties on units sold, rising to 12% after one million units sold, with only a small up-front payment. Bullfrog produced Populous World Editor, which gave users the ability to modify the appearance of characters, cities, and terrain. An expansion pack called Populous: The Promised Lands added five new types of landscape (the geometric Silly Land, Wild West, Lego style Block Land, Revolution Française, and computer themed Bit Plains). In addition, another expansion disk called Populous: The Final Frontier added a single new landscape-type and was released as a cover disk for The One. Populous was released in March 1989 to almost universal critical acclaim. The game received a 5 out of 5 stars in 1989 in Dragon #150 by Hartley, Patricia, and Kirk Lesser in "The Role of Computers" column. Biff Kritzen of Computer Gaming World gave the game a positive review, noting, "as heavy-handed as the premise sounds, it really is a rather light-hearted game." The simple design and layout were praised, as were the game's colourful graphics. In a 1993 survey of pre 20th-century strategy games the magazine gave the game three stars out of five, calling it a "quasi-arcade game, but with sustained play value". MegaTech magazine said the game had "super graphics and 500 levels. Populous is both highly original and amazingly addictive, with a constant challenge on offer". Compute! named the game to its list of "nine great games for 1989", stating that with "great graphics, a simple-to-learn interface, and almost unlimited variety, Populous is a must buy for 1989". Peter Molyneux estimated that the game accounted for nearly a third of all the revenue of Electronic Arts in that year. Orson Scott Card in Compute! criticized the game's user interface, but praised the graphics and the ability to "create your own worlds ... you control the world of the game, instead of the other way around". STart in 1990 gave "kudos especially to Peter Molyneux, the creative force behind Populous". The magazine called the Atari ST version "a fascinating, fun and challenging game. It's unlike any other computer game I've ever seen, ever. Don't miss it, unless you are a dyed-in-the-wool arcade gamer who has no time for strategy". Entertainment Weekly picked the game as the #16 greatest game available in 1991, saying: "Talk about big-time role-playing. Most video games posit you as a mere sword-wielding, perilously mortal human; in Populous you're a deity. Slow-paced, intricate, and difficult to learn: You literally have to create entire worlds while all the time battling those pesky forces of evil. " The game was released in the same month that The Satanic Verses controversy gained publicity in the United States following the publication of The Satanic Verses in the United States. Shortly after release, Bullfrog was contacted by the Daily Mail and was warned that the "good vs evil" nature of the game could lead to them receiving similar fatwā, although this did not materialize. By October 1997, global sales of Populous had surpassed 3 million units, a commercial performance that PC Gamer US described as "an enormous hit". In total, Populous has sold over four million copies, making it one of the best-selling PC games of all time. In 1990 Computer Gaming World named Populous as Strategy Game of the Year. In 1996, the magazine named it the 30th best game ever, with the editors calling it "the father of real-time strategy games". In 1991 it won the Origins Award for Best Military or Strategy Computer Game of 1990 1990 Computer Game of the Year in American video game magazine Video Games & Computer Entertainment, and voted the sixth best game of all time in Amiga Power. In 1992 Mega placed the game at #25 in their Top Mega Drive Games of All Time. In 1994, PC Gamer US named Populous as the third best computer game ever. The editors hailed it as "unbelievably addictive fun, and one of the most appealing and playable strategy games of all time." In 1990 Bullfrog used the Populous engine to develop Powermonger, a strategic combat-oriented game with similar mechanics to Populous, but with a 3-dimensional graphical interface. In 1991 they developed and released a true sequel, Populous II: Trials of the Olympian Gods, and in 1998 a further direct sequel, Populous: The Beginning. Populous was also released on the SNES gaming console, developed by Imagineer as one of the original titles for the console in Japan, and features the addition of a race based on the Three Little Pigs. Populous DS, a new version of the game (published by Xseed Games in America and Rising Star Games in Europe), was developed by Genki for the Nintendo DS and released November 11, 2008. The game allows the user to shape the in-game landscape using the DS's stylus. It also features a multiplayer mode allowing four players to play over a wireless connection. Populous has been re-released through Good Old Games and on Origin through the Humble Origin Bundle sale. It runs under DOSBox. The browser-based game Reprisal was created in 2012 by Electrolyte and Last17 as a homage to Populous. Godus (formerly Project GODUS) was revealed as a URL on the face of Curiosity – What's Inside the Cube?, and "is aimed to reimagine" Populous. ^ "David John Rowe's artist page". Box Equals Art. Retrieved 25 December 2017. "IGN Hall of Fame: Populous". IGN. 2008. Archived from the original on 4 November 2013. Retrieved 23 November 2013. Ernest Adams (2008). "What's Next for God Games". Designer's Notebook. Retrieved 2013-11-23. ^ "75 Power Players". Next Generation. Imagine Media (11): 51. November 1995. Its first title, Populous, created a whole new genre, the 'God' game. ^ a b Bullfrog (1989). "Populous user manual" (PDF). Populous. Electronic Arts. Retrieved 2013-02-22. ^ a b c d e f g h Molyneux, Peter (2011). "Classic Game Post-Mortem: Populous". Game Developers Conference. GDC Vault. Archived from the original on 22 January 2013. Retrieved 2013-02-22. ^ a b c d "The Making Of: Populous". The Edge Online. 2012. Archived from the original on 10 July 2012. Retrieved 22 February 2013. ^ a b Kritzen, Biff (August 1989). "And On The Eighth Day...". Computer Gaming World. pp. 16–17. ^ Eden, Maxwell (July 1992). "The World According To...Max / Electronic Arts' Populous World Editor". Computer Gaming World. pp. 40–41. Retrieved 3 July 2014. ^ Rignall, Julian (April 1989). "Populous review". Computer & Video Games. 90: 30–32. ^ 30 Point Plus: ポピュラス. Weekly Famicom Tsūshin. No.358. Pg.32. 27 October 1995. ^ Wilson, David (January 1992). "Populous review (re-release)". Zero. 27: 82. ^ Higham, Mark (April 1989). "Populous review". ST/Amiga Format. 10: 72–73. ^ Hamlett, Gordon (July 1989). "Populous review". Your Amiga: 46–47. ^ Lesser, Hartley; Lesser, Patricia; Lesser, Kirk (October 1989). "The Role of Computers". Dragon (150): 68–73, 95. ^ Gutman, Dan (July 1989). "Nine for '89". Compute!. p. 19. Retrieved 11 November 2013. ^ Card, Orson Scott (November 1989). "Gameplay". Compute!. p. 88. Retrieved 11 November 2013. ^ Plotkin, David; Reese, Andrew; Cushman, Carolyn (January 1990). "Strange New Worlds to Conquer". STart. Vol. 4 no. 6. ^ Staff (October 1997). "EA Signs Molyneux". PC Gamer US. 4 (10): 79. ^ Livingstone, Ian. "How British video games became a billion pound industry". BBC. Retrieved Nov 26, 2018. ^ "The 1990 Origins Awards". The Origin Awards. The Game Manufacturers Association. 1990. Archived from the original on 3 February 2013. Retrieved 2013-02-22. ^ Maxwell, Ben (21 May 2012). "Populous reborn in your browser". Edge-Online. Retrieved 14 September 2013. ^ Hamilton, Kirk (May 22, 2012). "This Free Game Takes Populous And Gives It A Sworcery Makeover". kotaku.com.au. Retrieved May 7, 2017. ^ "Project GODUS by 22cans — Kickstarter". Kickstarter.com. Retrieved 2013-08-22.